One of our biggest selling meads made from local apple cider with Madagascar-bourbon vanilla and Vietnamese cinnamon spice added. Get your piece of the pie! 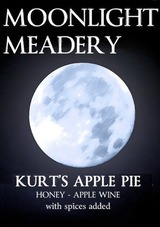 This mead is a great after dinner dessert wine that is a perfect finish to any holiday meal. Too full? Try over ice cream for a less filling last course with all the taste! Recipe named after life time best friend Kurt Demmer for sharing his recipe. Share with your friends!